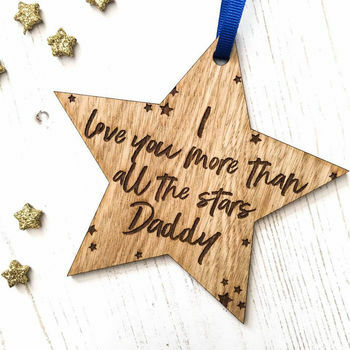 Our gorgeous, hand crafted Father's Day Star makes the perfect keepsake father's day gift from children. Give the erfect gift this father's day with this simple but beautiful wooden keepsake that will be treasured for years to come. Decoration reads 'I love you more than all the stards Daddy'.